This past week I stayed with my Aunt in the super small Colorado town of Erie, and had an almost mini stay-cation. Her house is super peaceful and she’s got two little pups named Ginger and Penny. I made green chili enchiladas and strawberry rhubarb crisp for the fam, took the dogs for walks around the lake and I blended in with all the town housewives at the local Starbucks. By blending in I really just sat diligently behind my laptop and casually eavesdropped and listened to them gossip, it was pretty entertaining and a nice week to say the least. Today I’m at the local library working because alllllllll the housewives and their newly-free-from-school kids decided to go to Starbucks and I just couldn’t hang. I mean was I at a coffee shop or Color Me Mine? I used to work at Color Me Mine, did you know?! So now I’m chillin’ with all the town grandpas watching them read history books and eat their donuts. Still just as entertaining. Man, am I people watcher OR WHAT?! Ha. Alright, alright onto the pretty cake. I know that is why you’re hear right?! I mean I gueeeeess listening to me rant can be kind of fun (insert winky emoji). This cake was inspired by my parter in crime this week: Hellmann’s Organic Mayonnaise. 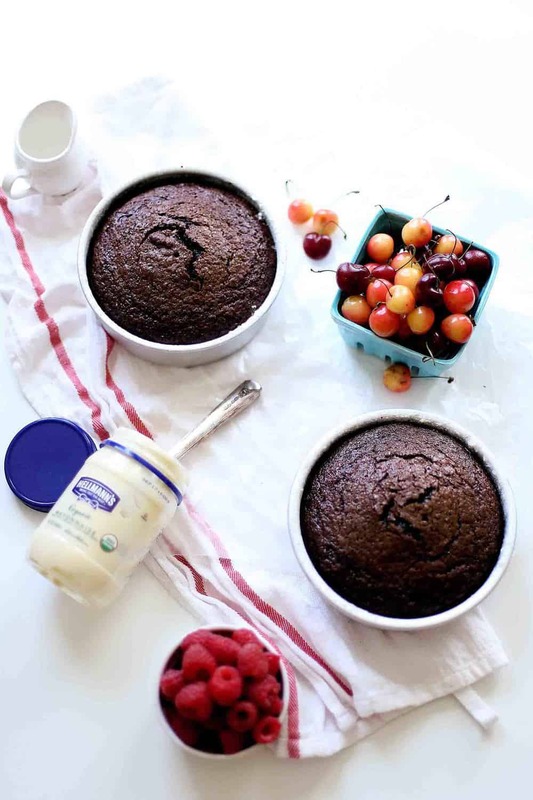 Hellmann’s organic mayonnaise was the perfect addition to my chocolate cake. I needed a cake that would withstand all my gorgeous summer berries I got going on and subbing mayo for butter was just the trick! You can also find Hellman’s new Organic mayonnaise in Roasted Garlic and Spicy Chipotle which are PERF for summer! The consistency of this cake is super moist but it also has some major structural powers. It’s the strongest chocolate cake I have ever made and I owe all my thanks to using Hellmann’s Organic Mayonnaise. 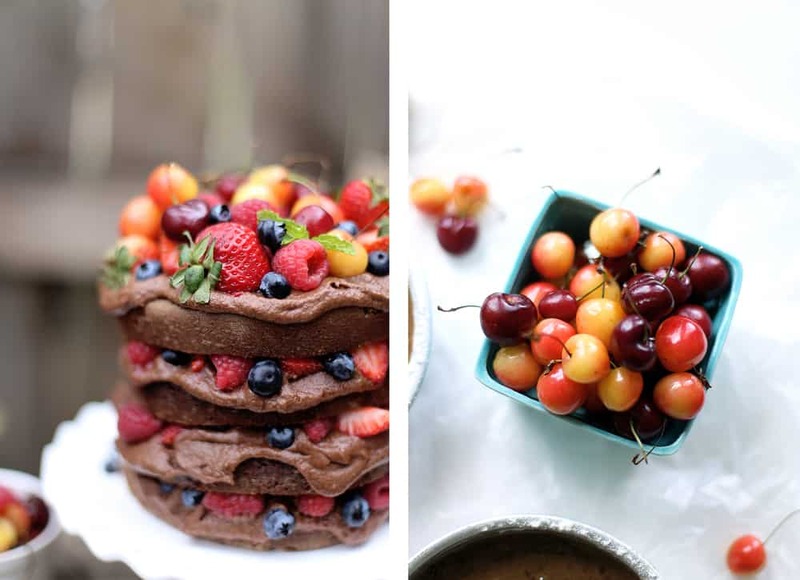 Chocolate cake can be very delicate and very crumbly sometimes but this batter was made to lift some serious cake weight. Hence all of my delicious berries piled high in all of their glory. 2. 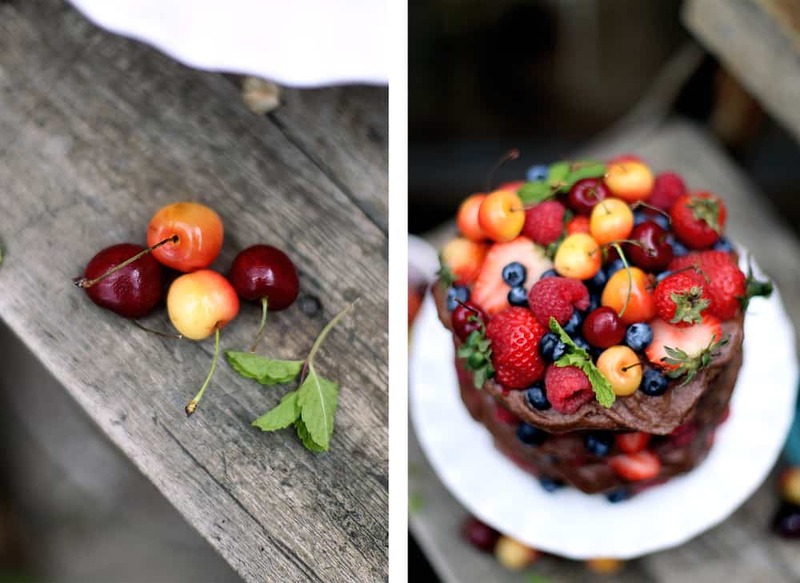 )are gorgeous and easy enough for anyone to replicate in his or her own kitchen. 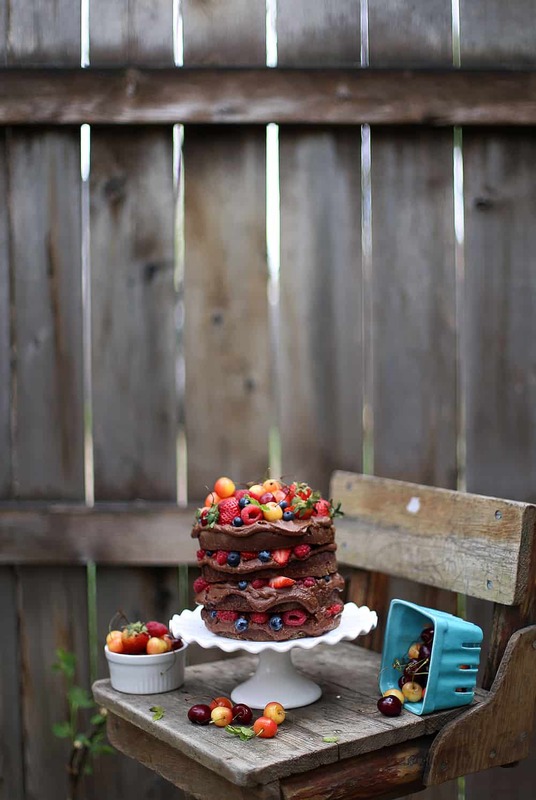 I know you guys can smear some chocolate buttercream between each layer and sprinkle on top every kind of summer berry imaginable! It’s a show stopper but won’t leave you feeling unstoppable. Ha get it?! Get it?! I’ll show myself out, thanks. Check the recipe below! Thank you to Hellmann’s Mayonnaise for keeping The Whisking Kitchen up and running! This blog post was created in partnership with Hellmann’s Mayonnaise and the FeedFeed all opinions expressed are my own! Preheat oven to 350 degrees Fahrenheit. Flour, grease, and line cake tins with parchment paper. 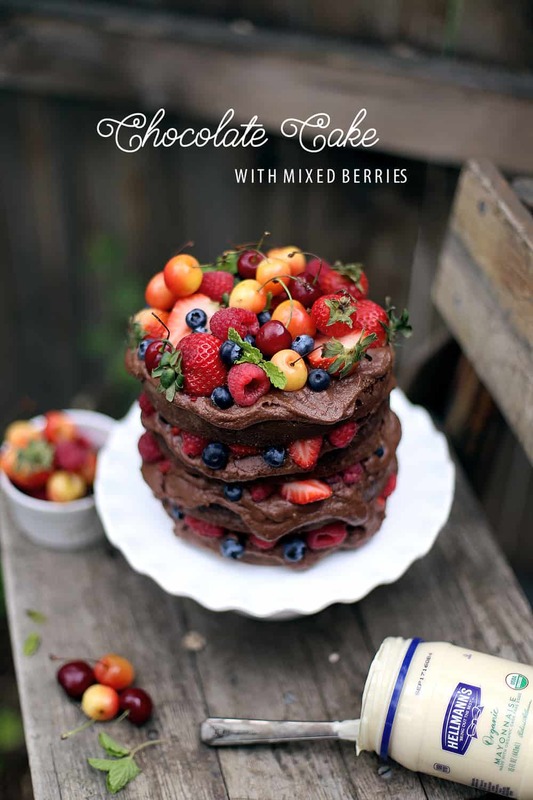 *note two – 6 inch cake tins were used in this recipe. In a large bowl combine flour, cocoa powder, baking soda, baking powder, salt, cayenne pepper and whisk well. In a separate large bowl fitted in a stand mixer of with a hand mixer beat sugars, vanilla extract, and eggs until light in color and fluffy, 1-2 mins. Add in mayonnaise and beat until incorporated. Remove from mixer and fold in hot water. *note, cake batter will be very thin. Pour evenly into cake tins and bake for 25-30 mins or until a tooth pick comes out clean from the center of the cake.Remove cake from oven and cool for thirty minutes. Run a knife around cake edge and remove from tin. Finish cooling on wire rack for an additional thirty minutes. In a large bowl beat butter, vanilla extract and salt until light and fluffy. Add half of powdered sugar and cocoa powder and beat. Next add in half of heavy whipping cream. Continue until all ingredients are incorporated and buttercream is fluffy. *Note to thin frosting, add in additional tablespoons of heavy whipping cream. 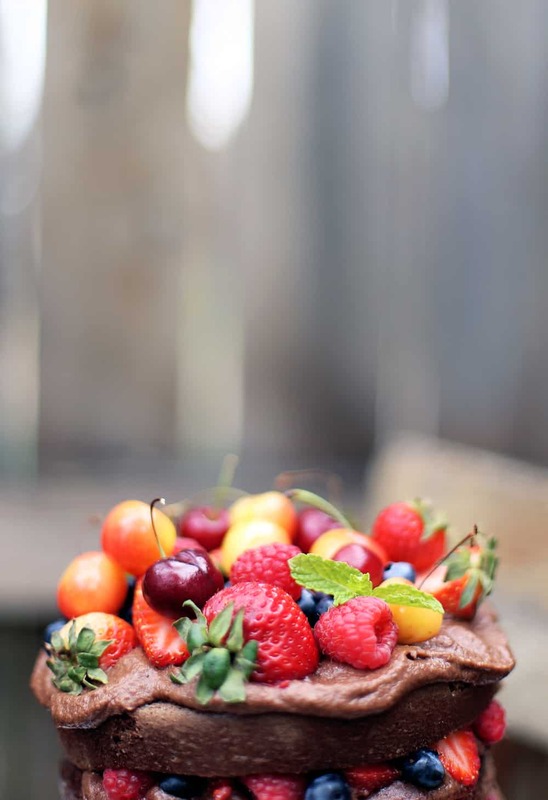 Construct cake with chocolate buttercream and fresh berries for the ultimate summer treat! Does this recipe ever say when to add the dry ingredients to the wet? I’m totally not seeing that!